The Seebeck effect allows the direct conversion of heat into electrical energy. For an economic use of this effect, materials are needed in which a given temperature difference in the material generates the highest possible electrical voltage. Research has been working intensively on the development of such materials for several years. High reliability and reproducibility of measurement results on these materials are indispensable. Reliable readings are also the basis for understanding thermodynamic processes. The evaluation of the efficiency of the energy conversion is based on the so-called thermoelectric figure of merit ZT. This calculation is based on the Seebeck coefficient (S in [V / K]), the electrical conductivity (Sigma in [S / m], the mean absolute temperature (T in [K]) and the thermal conductivity (Lambda in [W / (m * K)]). The values ​​that a measurement method produces are always subject to a certain degree of uncertainty. The calculation of ZT requires the measurement of the three mentioned thermoelectric parameters. The measurement uncertainties of the individual methods multiply and lead to a result that can deviate greatly from the actual value. Linseis offers with the LZT-Meter or the LSR-3/4 a device platform, which records the individual quantities simultaneously. The integrated software corrects distorting influences and, in addition to the individual material values, directly supplies the ZT value. Since the Seebeck coefficient is included in the calculation of this value with the square, Linseis attaches particular importance to the accuracy of this measurement. 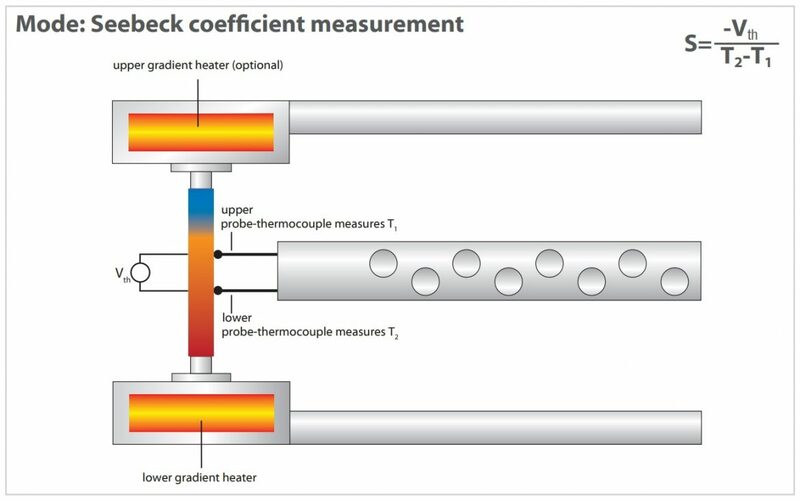 For the measurement of the Seebeck coefficient, two thermocouples are used to determine the temperature difference between two contact points of a one-sided heated sample. The voltage difference is measured between two homopolar wires of the thermocouples. The measured values ​​give a voltage-temperature curve. The Seebeck coefficient is the slope of this curve. As interference for the measurement must be taken into account that the wires in the thermocouples have their own Seebeck coefficient. In addition, at a temperature difference of 0 K, a non-zero voltage difference often occurs, which must be taken into account as a device-specific offset voltage. These physical influences complicate the measurement process. As the lensis LSR platform was carefully developed to take these factors into account, the meters provide high repeatability and accuracy. poor (electrical) contact between the thermocouples and the sample. High linearity deviations of the temperature-voltage curve can be avoided by choosing the optimum temperature difference. The thermocouples must be calibrated regularly. In case of contamination, damage due to chemical reactions with the sample and heavy wear, the thermocouples must be replaced. The contact pressure thermocouple – sample must be sufficiently high, but must not lead to deformations of the sample.